football as a billboard… for politics? Kit sponsors — at least for as long as I can remember — have always been the subject of much debate within the beautiful game. Is shirt advertising a distraction, or is it beneficial? Will it sully the beauty of the match by effectively turning your favorite players into running billboards on the pitch? What is an inappropriate sponsor and what isn’t? a romney sponsorship will net you publicity, if nothing else. And thanks to an ambitious sponsorship move Stateside, the debate over the merit of displaying another company’s logo on a jersey has been opened once again. While MLS’ franchise FC Dallas announcing their first major shirt sponsor partnership with nutritional supplement maker AdvoCare might have been the bigger news, the one that should have been making headlines involved the significantly smaller side, FC New York. A member of the fourth-tier National Premier Soccer League — and perhaps the owner of the worst sports franchise website of all time — FC New York recently announced that their newest shirt sponsor would feature the campaign logo and slogan for current Republican presidential candidate Mitt Romney. I love futbol, I love America, I am a proud Latino-American who believes Mitt Romney needs to be our next president. So even if Mitt didn’t write the sponsorship check himself, you still have to admire the ingenuity in the move in some respects. With television commercials, political rallies, billboards, signs and bumper stickers all starting to feel a little stale, this was a great example of thinking outside the box. Whether it ends up of being of great benefit to Romney’s cause remains to be seen, but it’s still is an interesting way to get the former governor’s name out there. But thanks to large swaths of the American soccer fan base having liberal leanings, the announcement was quick to receive backlash. Forums and social media sites were up in arms, ready to storm the pitch with pitchforks and torches over the sponsorship. Would they have raised such a storm if an Obama-backing SuperPac had sponsored FCNY? I don’t know that answer, but let’s just say I wouldn’t bet the farm on it. Regardless of which side you support, there’s nothing new about such controversy. We’ve heard this song and dance before, as it’s just another dispute over the moral dilemma of sponsors in the first place. you can credit eintracht braunschweig for dropping the original jäger-bomb. Even from it’s very beginnings, the idea of slapping a sponsor’s name on a club’s shirt was a controversial one. The first ever shirt sponsor was on the shirt of German side Eintracht Braunschweig in 1973, when they sported the logo of liqueur giant Jägermeister on their chests. Despite shirt sponsorships being outlawed outright at the time, BTSV were able to circumvent the rules by — get this — temporarily changing their club crest to a version of the Jäger emblem. Now that’s what I call dedication to the dollar. Kettering Town, the first English side to adopt a sponsor, faced a similar backlash in January of 1976. After brokering a deal with local company Kettering Tyres, the company name appeared on the players’ shirts in a match against Bath City on January 24th. When the FA caught wind of this four days later, they promptly ordered it removed. Not about to give up on the extra income, club chairman/manager/center forward Derek Dougan removed only the final letters, changing the wording on the shirts to “Kettering T”, as if it was to represent the club name. Seeing right through the ploy, the FA countered with a threat of a £1,000 fine, and Dougan succumbed to their pressure. However, he remained undeterred and — having gotten further backing from Bolton and Derby County — successfully convinced the FA to allow shirt sponsors in June 1977. Coincidentally, Dougan and Kettering were unable to secure a sponsor for that season. C’est la vie. Similar opposition claims that corporate logos don’t belong on an athletic team’s jerseys resonates particularly well here in the States, thanks to our traditional sporting culture frowning upon tainting the “sacred” empty spaces found on our baseball, basketball and football uniforms with ads. Which does seem highly ironic, considering the American sports fan is willing to unnecessarily stop the action repeatedly throughout a match for “TV timeouts” (see: advertising timeouts) to protect the sanctity of the uniform. But what about political entities: do they have a history of sponsoring football sides? there’s already too much political influence in the beautiful game. Surprisingly (to me at least), there have actually been very few cases of government or political logos ever ending up on a professional side’s kits. And even then, they’re pretty weak examples or rather roundabout. In fact, the only true examples of a campaigning politician plastering their logos on the uniforms of a sports team come from NASCAR… hardly shocking considering the racing circuit is the undisputed king of over saturated sports advertising. So with football so popular, especially amongst the legions of impressionable lower classes, why haven’t we seen hopeful politicians using the shirts of various football sides to promote their message? It’s rather simple actually: they’re not really allowed. Well, that seems pretty straight forward if you ask me. And luckily, I wasn’t the only one who thought this was a pretty black and white matter. The referee for their next match was quick to advise FCNY that they were in violation of FIFA regulations, and if they took the pitch in their Romney-flavored kits, they would have to forfeit the match. And when the NPSL chairman Andy Zorovich caught wind of the plans, he echoed the world’s governing body with a resounding “[they’re] not [wearing them] in an NPSL game”. And since the team are also in hot water with the league over mistreatment of opposing sides, not following league policies, and using deceptive advertising, the potential threat of having their charter pulled over the Romney-sponsorship didn’t seem worth the risk. Look, football is already overly politically charged. 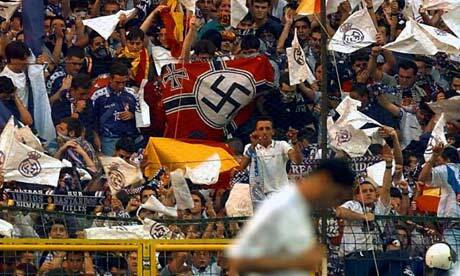 Entire clubs and fan bases the world over have been brought together thanks to their political beliefs. Similarly, politics within the clubs themselves often involves mud-slinging and tomfoolery not too dissimilar from what could be seen during your average presidential campaign. We don’t need politicians — and their (and their supporters) vast sums of money — piling on top of all of that. And while I admire the ingenuity in the move by FC New York’s mysterious anonymous donor, let’s just say that I’m more than happy to have seen the club lose out on any increased income if that means that they follow the letter of the law instead of pining for those who make them.